1943 Collyer Insulated Wire Co., Inc.
1943 ad for the Collyer Insulated Wire Co., Inc. It is 1 page. "Used by U.S. Navy and Shipbuilders everywhere." 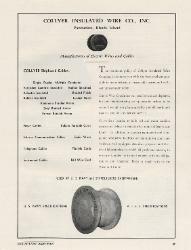 Collyer Insulated Wire Co., Inc.